Like many of the other kings of the Fifth Dynasty (Old Kingdom) of Ancient Egypt, Niuserre built his pyramid at Abusir. The pyramids of Sahure (possibly his uncle), Neferirkare (his father) and Neferefre (his brother) were aligned along a diagonal pointing towards Iunu (Heliopolis). Niuserre broke this pattern by placing his pyramid between the pyramid of Sahure and the pyramid of Neferirkare. This allowed him to incorporate the causeway and valley temple of his father into his own pyramid complex. However, it also gave him a limited area in which to build and so his pyramid is noticeably smaller than those around it. It is suggested that Niuserre used some of the masonry from the sun temple of Sahure to build his pyramid complex and may even have set the obelisk at the centre of the sun temple in his complex. His pyramid would have been around fifty two meters high when completed and had a base of seventy nine square meters. It was built with a slope of around fifty two degrees. The pyramid core was composed of seven steps of limestone and the sides of the pyramid were clad with fine limestone. The entrance is in the north face at ground level. A passage descends to meet a horizontal corridor before descending again to cut into the bedrock beneath the body of the pyramid. Three large portcullis block made of granite sealed this passage which beyond them turns to the east to meet the antechamber. The antechamber is clad in limestone and its roof is composed of the standard three layers of large limestone slabs with chips of limestone between them. It is linked to the burial chamber by a passageway exiting from the west wall. This passageway is directly under the apex of the pyramid. The burial chamber was also lined with limestone and had a roof formed by three layers of large limestone slabs and limestone filling. Two ruined pyramids nearby (Lepsius Tewnty-four and Lepsius Twenty-five) may have been the Queen’s pyramids of Niuserre’s pyramid complex, but this is not confirmed. His pyramid complex did include the other traditional elements (a satellite pyramid at the south east corner, a mortuary temple on the east side and a causeway leading to a valley temple). It is considered that he used the foundations prepared for the valley temple of the pyramid complex of Neferirkare. The entrance is formed by a portico with two rows of four columns. There was also a chamber linking the valley temple to the causeway. The walls of the temple were lined with fine limestone and the floor paved with basalt. The temple was decorated with painted reliefs and a red granite dado. 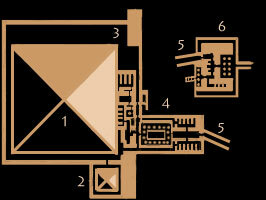 Niuserre also adapted the causeway of Neferirkare to his own pyramid complex. He lined the walls of teh causeway with black basalt and decorated it with reliefs depicting himself in the guise of a sphinx trampling the enemies of Egypt. The ceiling was painted blue and studded with golden stars. In order to link to his monument rather than that of Neferirkare the causeway had to take a sharp turn to link with his mortuary temple. The mortuary temple of Niuserre is rather unusual. It stretches south along the east face of the pyramid and the extends to the east giving it an unusual L shape. This is partly because a number of mastabas had already been built here forcing the temple to skirt around them. Despite its unconventional shape, the mortuary temple retained the main elements of other mortuary temples of the time; particulary resembling the mortuary temple of Sahure. A wall divided the inner temple from the outer temple. It featured two large structures which are reminiscent of pylons and probably represent the mountains of the horizon. The inner temple lies along the side of the pyramid and is composed of a series of storage rooms, an inner sanctuary and five statue niches. To the north of the entrance to the corridoor with the five statue niches there was another deep nich which held a massive statue of a lion formed from red granite. It is the first mortuary temple to incorporate a single pillar in the inner sanctum. The outer temple extends to the east and is composed of an open court lined with pillars and an entrance hall.